So, I took a few hours and created my three parent scripts and modified the interace elements to work with the objects. It worked great. I was proud I had OOP'ed my project. But, it was still fairly messy since all three objects contained many of the same methods. If I wanted to update how the changeTexture method worked, I had to change it in all three parent scripts. This held true for many of the methods. It dawned on me then that I could put Lingo's ancestor property to work and create a separate "common" parent script that would contain the methods common to all three of the main parent scripts. Lingo's ancestor property is the means by which OOP in Lingo provides inheritance, as it's sometimes called in other OOP languages. Basically, what it means is that one object can "inherit" the properties and methods of another object. If you call a method within an object and that method doesn't exist, Director will search the methods within the object's ancestor. This can give you a ton of flexibility, as you will see. And, though we won't go into it here, you can change an object's ancestor property on the fly, allowing you to instantly change the behavior of your object. Now, there are really two ways you can go about using ancestors to extend your objects. You could have one base object that had different ancestors that you swapped out, or you can have different parent objects with one shared ancestor. If you've been paying attention you'll know that I chose to use the later method, because it simply seemed most logical for my project. Let's go ahead and look at the parent script for the cube, and then its ancestor next. The first thing that any parent script needs is the new method - known as the constructor in other languages. This method lets you initialize your object and also returns a reference to the instance of the object, in the form of a pointer to a memory address. That's really not important though, just know that the new method returns a unique reference to the object's instance, and you can store this reference in a global variable. As stated previously, the new method returns a unique reference to the script being instantiated. In this case the unique reference is stored in the ancestor property of our cube parent script. Our cube script has now "inherited" the methods, and properties, of the "common" parent script and is free to use them as if they were contained within the cube's own script. Simple, right? Although the setStyle method is located in the ancestor script, the cube object can still call it because of the ancestor property that was defined. First, you send the cube's reference (me) to the setStyle method, along with the #wire parameter that sets the cube's renderStyle property to wireframe mode. Notice that this method is referencing the shdRef property, a property defined not within this parent script but within the original cube script. Actually, there are no properties defined here, they are all defined within the base obejct itself. And this is why the property is preceded by the me reference. Recall that you sent the cube's reference into the method when you called setStyle in the first place. 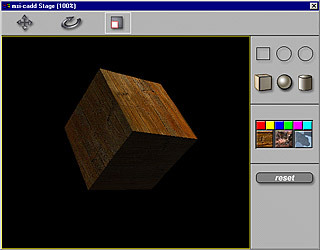 So, me.shdRef.renderStyle is really like saying theCubeObject.shdRef.renderStyle. You are probably starting to notice that these scripts are quite specialized to their particular purpose, and are not generic at all. If the ancestor script is to be common to the three parents ("cube", "sphere", and "cylinder") then all three of those base objects need to use the same property names (shdRef, modRef, etc.). When you're doing the designing, though, this shouldn't be a problem. And for this project using the ancestor script still greatly simplified the whole thing. Nifty eh? You could take this all the way to allow enemy ships in a game to have various behaviors simply by swapping ancestors. And there are, of course, many more uses once you start thinking in terms of using objects and ancestors in your projects. Once you start using them more you'll be surprised at how much they can simplify things, and make them more powerful all at once. Unfortunately, I can't release the completed demo project but if you'd like the complete scripts for the cube and it's ancestor you can click here to download the Director 8.5 .cst file as a ZIP or SIT archive..
Dave Mennenoh is a freelance multimedia developer for-hire, living in Milwaukee Wisconsin. Recently, he authored the book "Director 8.5 Shockwave Studio: The Complete Reference" for Osborne / McGraw-Hill and has been busy jotting down notes and ideas for the next one. When Dave's not at the computer he can usually be found bombing through the woods on his mountain bike, cooking a healthy vegan meal, or watching "The Simpsons."